This latest figure set from Bronco is perfect for their 1/4 ton 4x4 light truck kits. It includes four figures in various poses, all of them looking rather relaxed as things go. 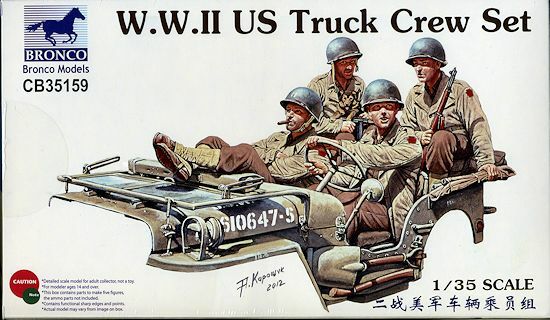 There is a driver, a front seat passenger with his feet up on the windscreen (an officer)(which means you need to model the windscreen folded down), and a couple of guys in the back. These latter two are armed, one with a Thompson and the other with an M1. The guy with the Thompson also is holding a small dog.